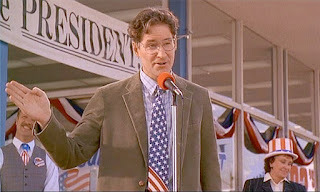 Temporary-employment agency owner Dave Kovic (Kevin Kline) has a part-time gig as an impersonator of the U.S. president (Kevin Kline). He is hired by the Secret Service to fill in for the American leader at the end of a fund-raising dinner; the president has more exciting plans. 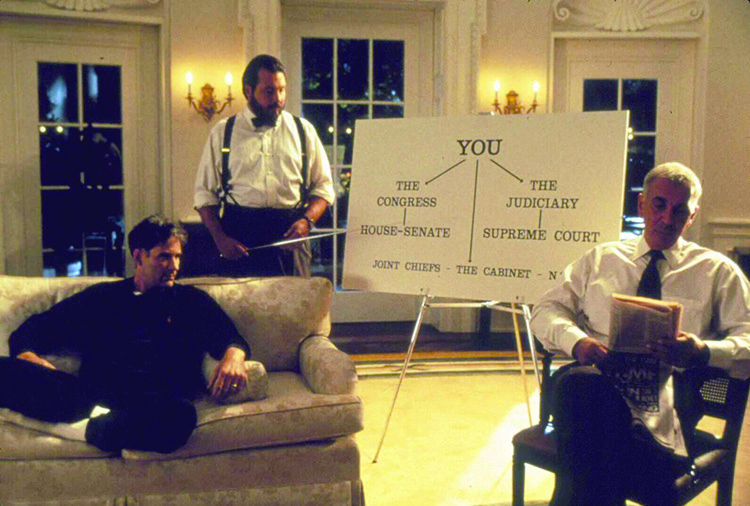 When the president has a stroke, the impersonator finds himself at the centre of a scheme by the White House chief of staff (Frank Langella) to use him for nefarious purposes. Dave is caught up in villainy, heroism - and a growing attraction to the the First Lady (Sigourney Weaver). Clearly inspired by the Prisoner of Zenda, Dave is what would come from Anthony Hope meeting Frank Capra. Like the latter’s films, this one features a likeable fellow, not exactly naive, but definitely trusting, being thrust into a world he’s not prepared for, and, like Capra’s heroes, he finds his own ways of dealing with it. As he does, the viewer has a very good time. Fun and funny, Dave profits immensely from the lead actor, Kevin Kline, who can handle comedy and drama equally well. 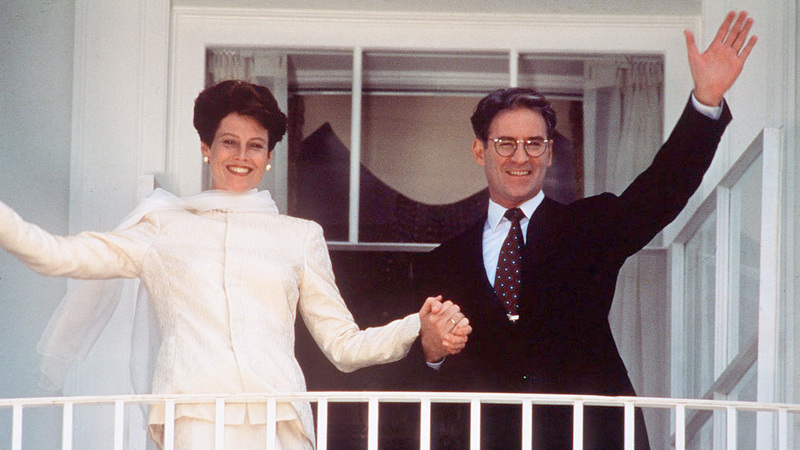 His optimistic character is a decent, honest man but not incredibly so - witness his decision to take a few ‘souvenirs’ from the White House (e.g. towels, and such) - caring and happy-go-lucky. His determination to do some good in his new situation is balanced by his desire to enjoy himself, as well. 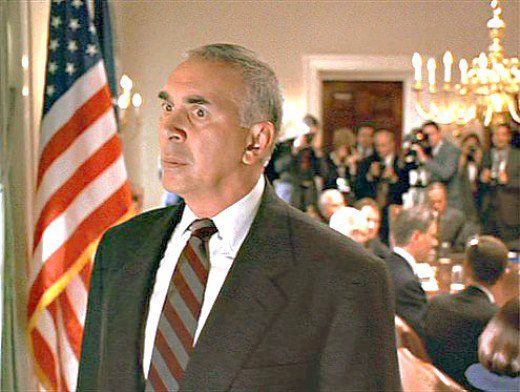 Langella, as the presidential chief of staff, has little stated motivation behind his action except a craving for wealth and power; his ally, the White House communications director (Kevin Dunn), is more reluctant in his criminality, and, fittingly, his motivation is even less defined. But we accept that they have been involved in wrong-doing for some time, so when we find, like the protagonist, that evil forces are at work, we accept them as such, without worrying too much about their origins. This is, after all, a light-hearted comedy, not a psychological study. The script is good, clever at times, though not hilarious. There are some good lines that can be both entertaining and revealing (such as when the patently vain president regards his double and states, “You’re a very handsome man”) but, for the most part, it’s their delivery that provides the humour. Even Langella, better known for the intensity of his dramatic performances, proves himself quietly effective at comedy. What will be lost on a generation watching Dave a quarter-century after its production are the effect of the many cameos by news media personalities (eg. Sander Vanocur, John McLaughlin), entertainers (eg. Larry King) and politicians (e.g. Alan Simpson, ‘Tip’ O’Neill) of the time, appearing as themselves. This elements does not, however, detract from the film’s present enjoyment, as they may simply be taken as what they are portraying, without their identities being known. 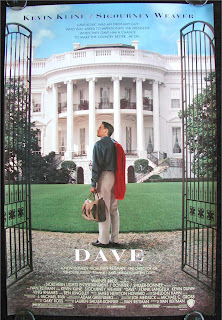 Dave is undemanding, almost gentle; it’s not a political thriller, though it does have a clever ending. It’s a light, enjoyable time at the movies - something one doesn’t find too often these days. I remember that movie. I don't think Hollywood could make a film like this anymore--at least, not as an essentially cheerful story. They'd turn it into some sort of heavy-handed, finger-wagging downer of a lecture. Yes, I don’t like being lectured or subjected to propaganda in a movie. 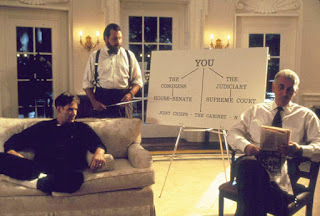 I recall watching “The American President” (1995) and enjoying it, but noting that while the Democrats in the film were youthful and good-looking, the Republicans were all old men who smoked cigars in dark rooms. 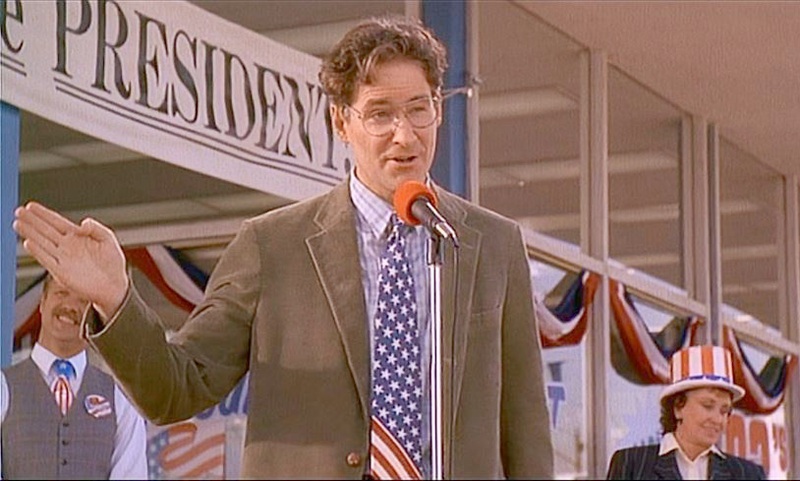 In “Dave”, my inference, drawn from other politicians’ reactions, was that the president was a Democrat, but was a malevolent heel. In fact, his party allegiance was unimportant. Oh, I like this movie, and I rewatch it whenever I stumble across it on TV. 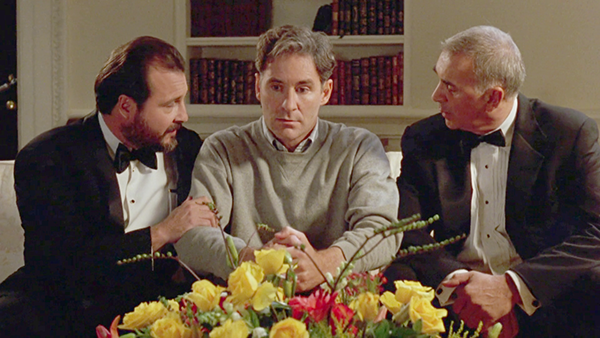 Frank Frank Langella was a creep, and a well-played one at that! 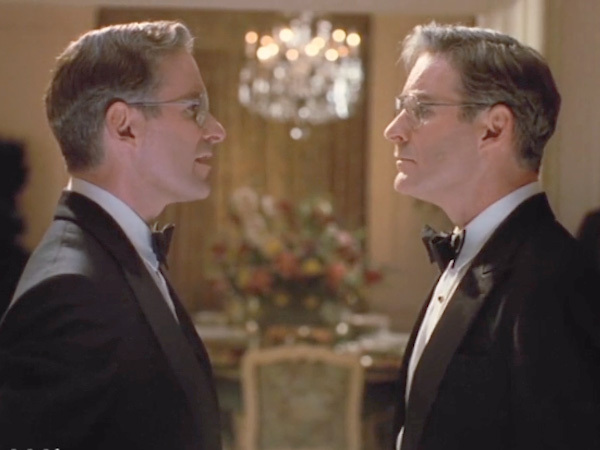 I think Kevin Kline did a terrific job in both roles, but he's one of my favs (except for Wild, Wild West). I agree, especially about “Wild Wild West”. What the heck happened with his judgement there? Oh, how I loved this movie. I had forgotten all about it until I read your blog. Thanks for helping me remember it.